Long after the terrifying experience of a home fire, the smell of smoke lingers – permeating clothing, furniture, walls and literally everything else in the home. Even when a home fire was relatively minor or confined to a small area, the smoke smell can still permeate your entire house. Porous materials in particular, such as furniture, window treatments, carpeting and clothing absorb the smell of the smoke, making your home virtually unlivable – and yet you do not want to discard your treasured possessions and furnishings! Our professional smoke removal technicians understand how much your home and your belongings mean to you – and we have the equipment, the technology and the experience to salvage most or all of your smoke damaged personal property – and restore your home to its original pre-fire condition. Removing smoke damage requires immediate action with professional equipment. Simply “airing out” belongings will never be sufficient to remove smoke smell. And allowing time to pass will only make it more difficult to remove the smoke smell. Do not delay in calling us. We will immediately start working to restore your smoke damaged residence to the home that you love. Never attempt to ‘do it yourself’ or use ‘home remedies’ when removing smoke damage. Do-it-yourself smoke removal attempts actually can make the problem worse and/or result in damage to your possessions. Utilizing the proper smoke removal techniques using the appropriate (and safe) cleaning agents requires years of smoke damage experience and knowledge. Our smoke removal team is trained in cleaning every type of household surface – including upholstery, drapery, drywall, fabric, metal, wood and more. Additionally, we also understand the different “types” of smoke that are caused by different types of fires: grease, electrical, food, etc. So we know exactly what tools, cleaners and techniques to use in different types of smoke damage situations. We offer 24 / 7 emergency smoke removal response – and can be at your door the same day as the fire. We will professionally analyze the type of the smoke damage – and quickly provide you with a quote and a detailed plan of action. We will also provide your homeowners insurance with all documentation necessary to get you insurance claim rapidly processed. 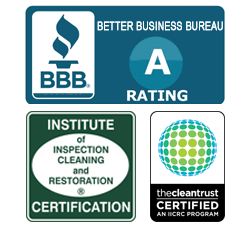 Aaron’s Restoration has the experience, training and state-of-the art technology necessary to completely remove the smoke smell from furniture, upholstery, window shade & drapery fabric, clothing, personal possessions, carpet, rugs, walls and more. We will also coordinate your smoke removal services with your homeowners’ insurance company to make certain that they receive all necessary information to get your claim processed as fast as possible. If you have experienced smoke damage from the aftermath of a fire, call us at 888.442.2766 to discuss your smoke removal needs.